In summer when peaches are at their peak, there is nothing better than enjoying the sweet and juicy fruit. And eating one out of hand is a good way, but sometimes you are just craving a dessert—but one that doesn't have too many ingredients that will mask the peach's fresh flavor. The crumble topping is what makes this recipe special, along with the bit of cinnamon. 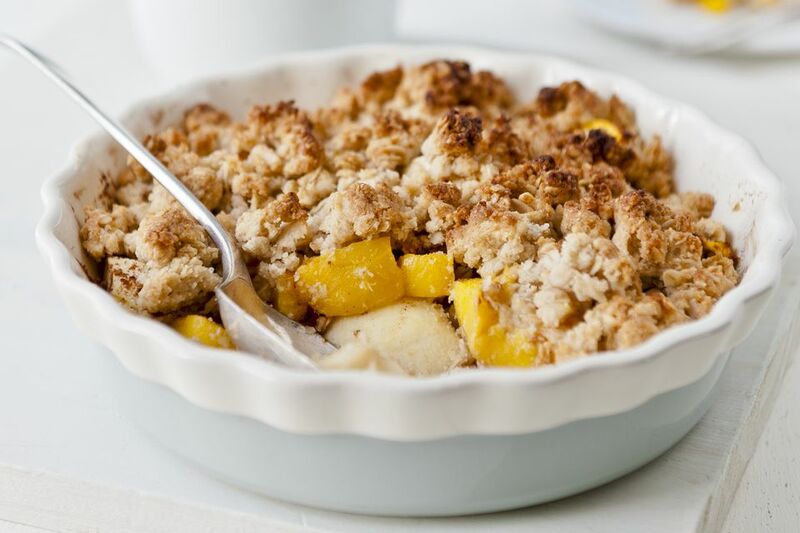 Even better is that this peach crisp is very easy to make. If it is too hot to turn on the oven, make this peach dumplings recipe which cooks on the stovetop. Similar to a cobbler, a sweetened batter is spooned onto peaches simmering in water, sugar, and butter. Once the pan is covered, the dumplings puff up and become tender, and are delicious with a sprinkling of cinnamon sugar. Preheat oven to 375 F. Butter an 8-inch square baking dish. Peel the peaches and remove the pits. Slice the peaches and arrange them in the prepared baking dish. In a medium bowl, combine the flour, sugar, salt, and cinnamon. Mix to blend thoroughly. Cut butter into the flour mixture with pastry blender or fingers until mixture resembles coarse meal. Sprinkle the crumbs evenly over the peaches in baking dish. Bake the peach crisp for 45 to 50 minutes, or until the topping, is golden brown and the peaches are tender. Serve peach crisp warm with cream, whipped topping, or vanilla ice cream. When shopping for peaches, choose ripe fruit. To check for ripeness, press the fruit gently; it should have a slight amount of "give." If the peaches are too firm, leave them on the counter to ripen or put them in a brown paper bag with a few holes poked in it. Adding a banana to the bag can speed ripening even more. Check for progress frequently. Store leftover fruit crisp in the refrigerator for up to 5 days. Instead of peaches, use fresh sliced mangoes in the fruit crisp. Add about 1/2 cup of finely chopped walnuts or pecans to the crumble topping. Replace fresh peaches with frozen (thawed) peaches.